62% of respondents listen to digital audio, be it Internet radio, streaming sites or other online media. 71% of Hispanic listeners in the United States spent between 1-12 hours on Internet radio per week. 83% of Hispanic in the United States consume digital audio through the smartphone. 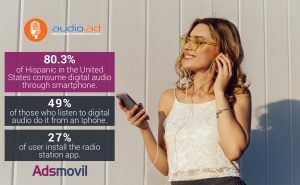 Miami, January 2018 – Audio.Ad, a Cisneros Interactive company specializing in digital audio advertising solutions for Latin America and the U.S. Hispanic market, Adsmovil, the leading mobile advertising company targeting the U.S. Hispanic market, and Quriously, the research platform carried out the study, “The State of Digital Audio in the US Hispanic market,” to analyze the digital audio consumption habits of Spanish speakers living in the United States. DIGITAL AUDIO CONSUMPTION – 62% of respondents listen to digital audio, be it Internet radio, streaming sites or other online media. LISTENING TIME – 85% of Hispanic listeners spent between 1-12 hours on Internet radio per week. WHEN DO HISPANICS LISTEN TO DIGITAL AUDIO? – 32% of the public do so during the afternoon or at night, and 49% listen to online radio on the way to work or in the office. CONTENT GOES VIRAL – 52% of responders who listen to Internet radio share content and participate in social media while they listen. 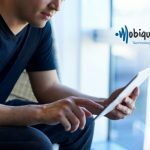 PREFERRED DEVICE FOR LISTENING TO INTERNET RADIO – 8% listen through desktop computers, 80.3% do it through smartphones and 10.2% listen through tablets. DIGITAL RADIO CONSUMPTION ACCORDING TO AGE – Although the highest percentage of audio consumption is reflected in the population over 55 years old, the youngest age range (13 to 34 years old) has a significant number of listeners with 34.2% of the total number of users surveyed. PREFERRED DIGITAL AUDIO CONTENT – 3% of responders listen to music, 18.6% listen to news and 16.8% choose sports. ASSESSMENT OF THE RADIO – 6 out of 10 respondents (60%) consider that listening to digital audio is an important or very important part of their day today. ONLINE STREAMING SITE – Between the sites of this category more listened by the Hispanics living in the United States, are YouTube with a 47.8%, Pandora 33.9%, Spotify with a 26.1%, Google Play Music with a 16.7% and iTunes 10.6%. ADVERTISING AND RADIO – 62% of respondents say they have purchased in the last year 2 to 10 products promoted through digital audio advertising. On the other hand, 71% believe that the amount of digital audio advertising is scarce to moderate. 5 TOP PRODUCTS/SERVICES THAT ARE MOST INTERESTING FOR DIGITAL RADIO CONSUMERS – First with 27.6%, is Technology (TV, Tablets, laptops, PC, etc. ), followed by Appliances with 22%, Cars with 18.7%, Supermarkets with 16.3%, and in fifth place Tickets for events (concerts, cinemas, theaters) with 13%. “This study is a contribution to the advertising industry, mainly because it shows the audio consumption habits of users today. 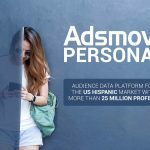 The Hispanic market in the United States is fundamental for the growth of online advertising and the results of this study are key for any advertiser who wants to develop advertising strategies aimed at reaching their audience in a more direct and precise way,”said Carlos Córdoba, Co-founder of Audio.ad. “80.3% of the spanish speakers in the USA consume digital audio through smartphone. 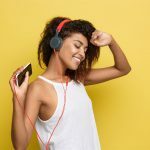 This is a huge opportunity for the advertisers to run campaigns in online radio, podcast and via streaming music, because, they can reach Hispanics in the United States, and segment the by age, male or female, country of origin, location and musical genre of their preference, in addition to being able to measure and optimize advertising investment in an effective and efficient manner,” says Andrew Polsky Chief Revenue Officer of Adsmovil. To download for free the study “State of Digital Audio in the US Hispanic market 2019” go here.